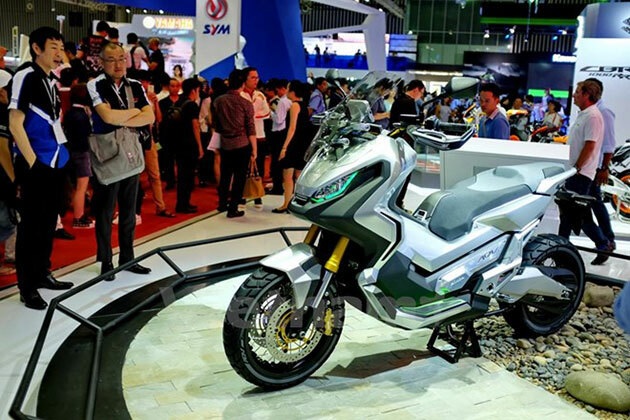 The second Vietnam Motorcycle Show 2017 (VMCS 2017) will take place in A model displayed at the Vietnam Motorcycle Show 2016. This year, the event will draw large brand names including Honda, Piaggio, Suzuki, SYM and Yamaha, as well as major importers such as Benelli, Ducati, Kawasaki, Peugeot and Harley Davidson. At the exhibition, the manufacturers and importers will introduce over 100 models of different types from commercial and sport bikes to motors and idea models, giving visitors an overview of domestic and world trends. According to Yano Takeshi, the event, themed “Free your wheels,” is expected to create a breakthrough for the motor industry of Vietnam. He highlighted that the exhibition will create a chance for manufacturers to overcome all challenges to make better products for customers in Vietnam, the fourth largestmotorbike market in the world. At the same time, the event will also gather 55 trademarks of support industries and spare part providers as well as relevant industries, including foreign brands including Motul, Bosch, Caltex, Total, Nissin and Quikfix. A number of games as well as music and fashion shows will also be held. According to the VAMM, last year, automatic motorcycles accounted for 45 percent of the total sales. The Vietnam’s motorcycle market is predicted to continue growing in 2017, the association added./.